The forgiving stain with no overlapping marks. 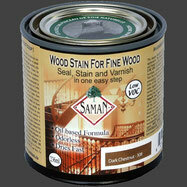 SamaN's stains are water-based solutions perfectly stabilized. It is thus possible to mix several colours to obtain an infinite number of shades as you would with watercolour paints. No need for a conditioner. Needs just one coat, exceptional coverage (8 oz. cover up to 50 sq.ft. ), ready to use, non-flammable. Really safe for both user and environment. For decks, siding, windows and doors Sikkens ProLuxe provides a distinctively rich and vibrant finish. Sikkens ProLuxe premium wood stains and finishes products are designed to provide unrivaled looks, durability and performance on all types of exterior wood. Sikkens ProLuxe's unique ink dye pigment consistently delivers vibrant coloured stains. Find the perfect wood stain or finish to bring out the natural beauty of the wood in your project. ARBORCOAT Premium Exterior Stains offer a variety of opacities in an array of captivating colours that let you express your own unique style. These finishes are designed to enhance the appearance of your deck, siding, or outdoor wood furniture with outstanding colour retention. 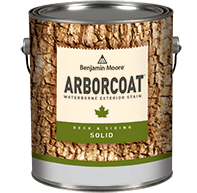 All Benjamin Moore ARBORCOAT finishes are easy to apply and offer superior protection while enriching the texture and grain of exterior wood surfaces. Benjamin Moore ARBORCOAT is available in Solid, Semi-Solid, Semi-Transparent and Translucent. 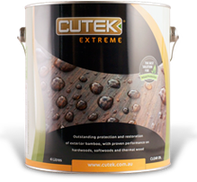 Cutek Extreme is a unique wood protection oil which keeps wood and engineered timber looking great for many years. It comes as a clear oil, with a choice of 10 colourtones which can be added to enhance the natural look of your project. Cutek Extreme is formulated to minimize warping and cupping and splitting, which means your exterior project lasts years longer. Clear Extreme fades over time, but retains the natural wood colour months longer than clear Cutek CD50, minimizing maintenance requirements for timber. With a colourtone, the added UV protection keeps the natural colour for much longer.